United Neighborhood Centers of Northeastern Pennsylvania (UNC) will once again partner with WNEP-TV’s Feed-A-Friend program to provide families in need with all the trimmings for a traditional Thanksgiving meal. Lackawanna County families with children in the household are eligible for the program and will receive a food basket including a turkey, dessert, vegetables, and other holiday foods. To register, please bring ID and proof of income (ex. access cards, unemployment records, current pay stubs, social security letter, etc.) and any form of documentation for each family member in the household (ex. access cards, birth certificates, or social security cards) to UNC’s Community Services building at 410 Olive Street in Scranton. Families can register from November 1-17, Monday through Friday from 9 a.m. – 5 p.m. and Thursdays from 8 a.m. – 6 p.m. 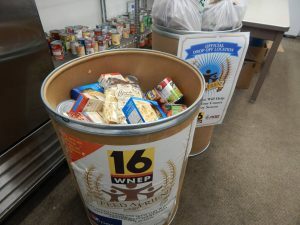 In addition to the Scranton-based Thanksgiving Food Basket Program, UNC will also partner again with the Upper Valley Project Hope Committee to serve families in the Carbondale area. To register for this program, please bring the same information noted above to the St. Rose Church Family Center (basement of 4 North Church Street, Carbondale) on one of the following dates: Friday, November 3 from 9 a.m. to 12 p.m.; Wednesday, November 8 from 3 p.m. to 6 p.m.; or Wednesday, November 15 from 3 p.m. to 6 p.m.
Last year, the Thanksgiving Food Basket Program fed more than 1,600 families in the community. UNC currently accepting both monetary and food donations to support the program. For more information, or to make a donation, please call 570-346-0759.